Laparoscopic gastrectomy is becoming more commonly performed, but acquisition of its technique remains challenging. We investigated whether laparoscopy-assisted distal gastrectomy (LDG) performed by trainees (TR) supervised by a technically qualified experienced surgeon (QS) is feasible and safe. The short-term outcomes of LDG were assessed in patients with gastric cancer between 2008 and 2018. We compared patients who underwent LDG performed by qualified experienced surgeons (QS group) with patients who underwent LDG performed by the trainees (TR group). The operation time was longer in the TR group than in the QS group (median time: 270 min vs. 239 min, p < 0.001). The median duration of the postoperative hospital stay was 9 days in the QS group and 8 days in the TR group (p = 0.003). The incidence of postoperative complications did not differ significantly between the two groups. Grade 2 or higher postoperative complications occurred in 18 patients (12.9%) in the QS group and 47 patients (11.7%) in the TR group (p = 0.763). Grade 3 or higher postoperative complications occurred in 9 patients (6.4%) in the QS group and 17 patients (4.2%) in the TR group (p = 0.357). Multivariate analysis showed that the American Society of Anesthesiologist Physical Status was an independent predictor of grade 2 or higher postoperative complications and that gender was an independent predictor of grade 3 or higher postoperative complications. The main operator (TR/QS) was not an independent predictor of complications. 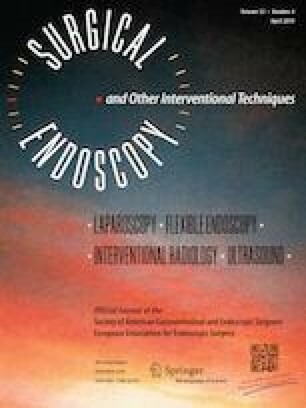 Laparoscopy-assisted distal gastrectomy performed by trainees supervised by an experienced surgeon is a feasible and safe procedure similar to that performed by experienced surgeons. T. Yamada, Y. Kumazu, M. Nakazono, K. Hara, S. Nagasawa, Y. Shimoda, T. Hayashi, Y. Rino, M. Masuda, M. Shiozawa, S. Morinaga, T. Ogata, and T. Oshima have no conflicts of interest or financial ties to disclose. This study, a retrospective analysis, was approved by the institutional review board of Kanagawa Cancer Center. Informed consent for using the clinical data without disclosing any personal information was obtained from all patients before surgery.